It is important to stay healthy during breastfeeding. The following information will guide you to keeping healthy so you feel well following childbirth. The advice on alcohol can be quite confusing and conflicting for breastfeeding mothers. It is widely suggested that the occasional drink is not harmful to your baby. The alcohol you consume can pass freely between your system and your milk supply and therefore some alcohol will be consumed by your baby. The highest level of alcohol will be found in your milk 30-60 minutes after consuming alcohol (60-90 when consumed with food). It is therefore advisable to avoid moderate to heavy consumption of alcohol whilst breastfeeding your baby. Eat a varied and fresh diet where possible as this will help to ensure that you keep well and recover as quickly as possible after the birth of your baby. You also need to drink plenty of water and other clear fluids in order to keep hydrated. Your diet does not generally affect your milk supply although in some cases it can change the taste of your milk or make your baby suffer more with colic. Speak to your health professional if you have any further questions about this. Very little caffeine passes from your system into your milk therefore moderate amounts of caffeine should not affect your baby’s behaviour. Some studies suggest that over 5 cups of coffee for example my have an effect. Remember that not just coffee and tea have caffeine in but also colas and other soft drinks, chocolate and medications. If your baby is being stimulated by too much caffeine they may be wide eyed, active , fussy and alert and not sleep for long. If you think caffeine may be influencing your baby’s sleep pattern reducing your caffeine intake can help, but may take from a few days to a week to improve your baby’s sleeping pattern. Smoke in a different room to your baby, or even better outside. Allow as much time as possible between smoking and breastfeeding to cut down on the nicotine found in your milk. Keep the number of cigarettes you smoke as low as possible to reduce the effects on your baby. Wear an extra layer of clothing when you smoke and remove it before you cuddle your baby to reduce the effects of passive smoking. Wait at least 10 minutes after smoking to pick up your baby and wash your hands. It is safer to breastfeed and smoke than it is to artificially feed your baby and smoke. 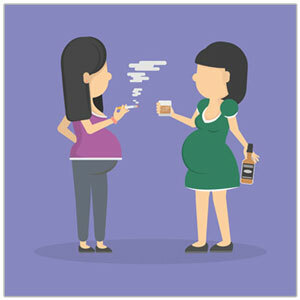 You are advised to never sleep with your baby if you/your partner is a smoker, or you/your partner have been drinking alcohol.